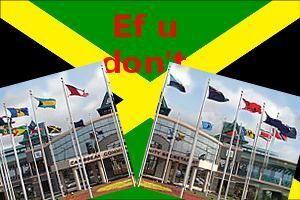 I think all this CARICOM talk is just a red-herring. Instead of blaming Trinidad and Tobago or CARICOM or any other body external to ourselves for where we are we need to put the blame where it belongs: Squarely on the shoulders of our politicians. Should CARICOM be rent over trade squabbles? Before I say anything else, please let me make it abundantly clear that I don’t adhere to either political party. However, when I look back at over the past 30 years, there was only one period, during the 1980s where it seemed like we were making some moves towards development. There were active and public initiatives to develop businesses like winter vegetables, canning, garments and a few other areas. With the possible exception of the call centres in the 1990s, I don’t see any of our leaders really creating an appropriate environment for growth and development. I don’t see our government training our people to be flexible and move with the times. Garments were the 80s, Call centres the 90s. What are we doing to stay relevant in the 21st Century? Sprinting and reggae cannot cut it. The living above our means by constant borrowing and high interest rates was a recipe for disaster. The constant cut and carve of the budget and taxing the few in the net within an inch of their lives also cannot do it. We cannot starve ourselves out of this crisis. We need to grow ourselves out of the crisis. Where is the protection and incentive for small businesses – the bread and butter of this country, the innovators, the entrepreneurs? Wealthy business people won’t get caught in the lurch. They have all sorts of methods of getting themselves out of any tax trap. Where are the incentives to protect the small? Where are the initatives for jobs (please don’t mention JEEP to me or I will get VILE!)? I am so sick of the small, petty, short sighted verbiage. And CARICOM? Please. I don’t think it has helped us in a big way, but isn’t that our fault? If T&T uses it to their advantage more power to them. We need to stop blaming anyone else for our problems and work and develop our way out of this. Give small farmers and businesses and innovators in renewable electricity benefits and bonuses. Make it mandatory that all homes have solar heaters and cisterns. Develop training centres so that our semi-literate population can retroactively get some education, and pump money into the early childhood education now so that we don’t lose yet another generation. Take on the public in terms of parenting and morality, as our people are frankly disgusting. Lead by example. Use the tax system to help and not harm.